One of the painful truths of living with Really Smart People is the constant struggle between shiny objects. When I married Spousal Unit, I didn’t know about Attention Deficit Disorder. Did anyone? When I look back at my school years, I can diagnose a few, but at that time, they were just unruly and distractible pains in the arse who spent a lot of time in the vice principal’s office. Within a short time of meeting Spousal Unit, I knew something wasn’t like it was with other boyfriends. Of course most of the other boyfriends had more brawn than brains and I thank the Good Lord daily that I didn’t marry any of them. They’re probably sitting on their sofa, scratching their crotches, drinking beer, farting and watching Justified. Instead, I married a nerd who sits on the sofa, scratching his crotch and farting as he watches Justified. The difference is that Spousal Unit drinks bourbon and analyzes plot twists and character development with me. That Boyd Crowder is a complicated man. Boy Child? It’s a wonder he can get out the door each day. So. Many. Distractions. Yesterday, I asked him to put away some leftover Easter candy, hoping he wouldn’t noticed how little was left as I wiped chocolate from the corners of my mouth. “Sure!” he said good-naturedly and went to retrieve a container for it. Ten minutes later he returned. “What can I do to help?” Uhhhhh…candy? He nodded his head and grabbed a piece of chocolate. Of course, if one is putting candy in a safe place, one must inspect each piece to determine length, depth, breadth and volume. Then one must check his phone for Reddit posts or texts from Girl Frand. Obviously, one must again search for a container for said candy. Twenty minutes later, I had consumed two Reese’s cups, a mini Snickers and a foil-wrapped chocolate egg before he wandered back in with some Tupperware. I didn’t have the heart to tell him that particular container was now too large, so I just stood there and burped peanut butter. I reminded him that the reason I was cleaning this particular room was because he wanted to bring his latest build downstairs for his dad to see when he returned from a business trip. Boy Child looked surprised and offered to help clean the room. I sucked chocolate out of a molar and gently suggested that it would help tremendously if he could find a place to put the candy. It is this same delightful entity on which I am depending for Operation Restore Camper. Since Daisy’s little hot flash, requiring fire extinguishers, it seems as if other, shinier objects have taken his attention. “Let’s work on Daisy,” he suggests and I vigorously nod my head in reply, offering a reminder that creating an electrical plan and diagram is next on the list. He agrees, pulls off the bow tie he wore to work and disappears to his room or the garage until he’s hungry again. In the few months he’s been home, taking a break from school, he’s built two quad copters (drones), another motorized bike (because one is apparently insufficient) and a 3-D printer. He built the printer in three days. The directions were 240 pages. This is the kid who would break my parents’ hearts by building an entire Lego diesel train engine kit on Christmas day before Santa had even gassed up the reindeer to get back home. “We thought it would take him weeks to do that,” they would pine. And I thought it would take only weeks to simply paint a camper and sew fancy curtains. We all have our struggles, Nanna and Pawpaw. Mine are real. 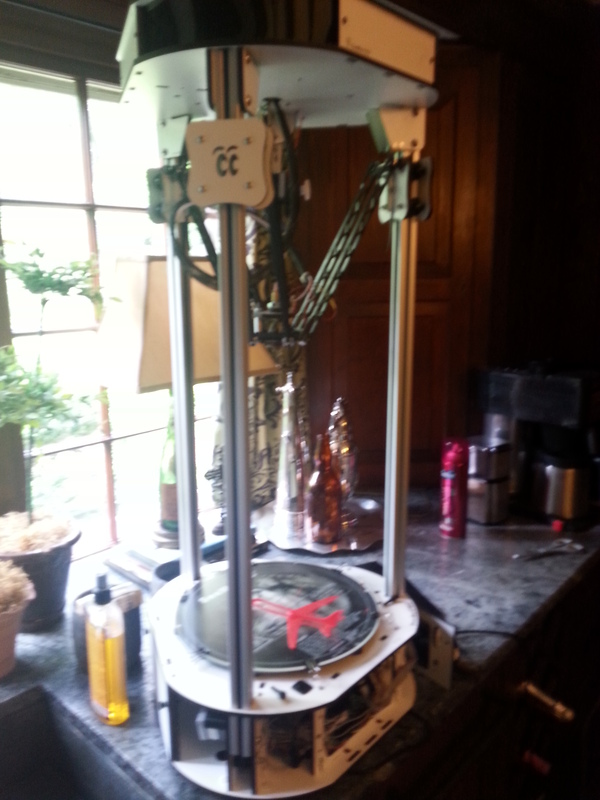 So, now we have a 3-D printer sitting in our house, next to the Justified-worthy bourbon and the coffeemaker. Boy Child started taking orders. I requested a model of Daisy, and Girl Child asked for the international sign of hospitality in the form of a certain hand gesture. She ain’t part of your system. It’s doable, he claims. It’s all doable. We will all get what we want in plastic. The future is plastics. He is the snake oil salesman of the 21st century. We are thrilled. Pieces that are missing from Daisy will be created. Fingers will be raised. We will be more equipped than astronauts in the space station, 3-D printing a desperately needed wrench. I am waiting for my Daisy model just as Daisy awaits new wiring. The last time I looked, there was a stringy outline of an airplane stuck to the printing plate. Apparently, the 3-D printer is also easily distracted, and while its attention wandered, it spewed too much plastic and I am reminded of one of my favorite t-shirts. My big laugh of the week! Oh Lord…it IS genetic, isn’t it?